There were plenty of major disasters onscreen in 2017, but enough about Justice League. Instead, here is our list of the year's best films, from coming-of-age indies to social horrors. Oh, and one disaster did result in a masterpiece, thanks to an unlikely meeting of the minds between James Franco and Tommy Wiseau. 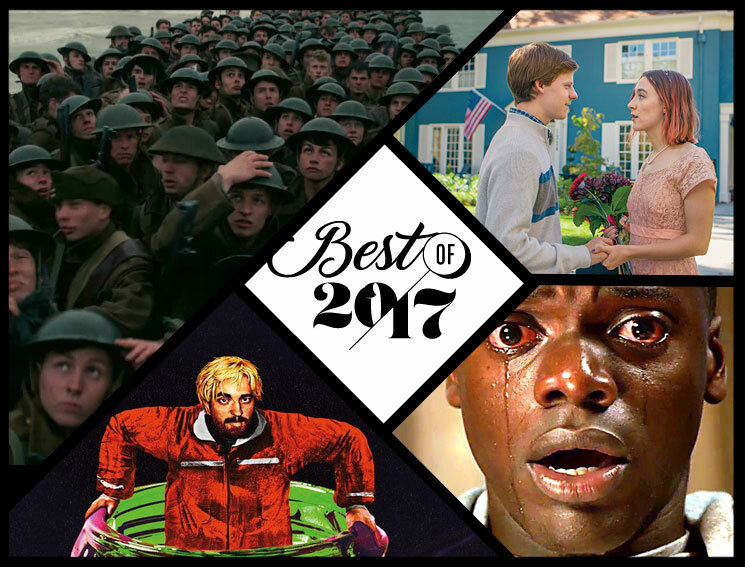 Without further delay, here are the films you need to catch up on before you say farewell to 2017 for good. In a year when indie cinema dominated most of our conversations about film, it's easy to understand why a movie like War for the Planet of the Apes — the third and final instalment of the famed sci-fi franchise's most recent reboot — hasn't been on a lot of year-end lists. But Matt Reeves' latest action-adventure, filmed mostly in close-ups, was one of the few big budget features in 2017 to have any sort of emotional resonance. It also had a couple of allusions to the epics of bygone eras (Apocalypse Now, The Great Escape) for classic cinema fans. As far as popcorn flicks go, here's one that's actually worth stomaching. With a few minor adjustments to his entirely unique formula, Yorgos Lanthimos' latest bizarre outing replaces blackened comedy with bone-chilling thrills, suggesting that perhaps he's been making horror films all along. The Lobster's Colin Farrell returns for another dose of the Greek new wave, and he's perfectly matched with Nicole Kidman in this strangely haunting morality tale that will ensure you never eat spaghetti the same way again. The box office has not exactly been a fun place for big-budget comedies in the last few years, but Girls Trip baffled the suits by packing theatres all over North America. The secret to its success? It's actually funny. Chalk it up to a cast that includes Regina Hall, Queen Latifah, Jada Pinkett Smith and, of course, darling of 2017 Tiffany Haddish, who absolutely dominated every scene and had audiences in fits of hysterics. Factor in Malcolm D. Lee's bright, joyous direction, and Girls Trip was a rare delight in a year that desperately needed more fun. The original Blade Runner holds a uniquely treasured place in science fiction film lore thanks to its retro-futurist philosophizing and slow-burning pace. This sequel, coming 35 years later, largely eschews those qualities for a leaner, more action-packed plot that leaves the original's mystique intact while forging ahead in its own direction, filled with riveting action sequences, dazzling visuals and an engaging story. Acclaimed director Denis Villeneuve (Incendies, Arrival) and star Ryan Gosling inject new life into the franchise, but it's Harrison Ford, reprising his role as Rick Deckard, who predictably steals the show. Turns out Christopher Nolan's shortest film since he broke onto the scene with 1998's Following may be his best. The British director doesn't mince words when retelling his countrymen's harrowing evacuation from coastal France in the early days of WWII, leaving little room for his characters to converse as they struggle against rocky seas, airborne attacks and each other's will to survive. Instead, he lets his visuals — all of which were captured on film — do the talking. Hans Zimmer's heart-pounding score helped make this an unforgettable movie that remains required viewing on the big screen (seriously, don't even think about downloading it). Further proving his knack for telling stories about marginalized communities without being exploitative, Sean Baker's The Florida Project is an ambitious and eye-poppingly beautiful story that highlights America's hidden homeless population. Centred on a Disney-adjacent motel in Florida, the film uses situational humour and heart-rending drama to elevate its universal themes. Willem Dafoe lends his expertise to the project, though newcomers Bria Vinaite and Brooklynn Prince will likely launch lengthy careers out of this one. Capping off director Luca Guadagnino's trilogy on human desire, Call Me By Your Name transforms André Aciman's acclaimed 2007 novel into a gripping drama about a whirlwind summer romance between a precocious teenager and his father's research assistant. The chemistry between the film's leads, Timothée Chalamet and Armie Hammer, is palpable, and drives the film while being refreshingly devoid of clichés like shame, rejection or an imbalance of power. It's yet another watershed moment in queer cinema; its strong supporting cast, Sufjan Stevens' score and gorgeous cinematography are icing on the cake. Part ode to the soul-crushing nature of Hollywood, part retelling of the story behind the most infamous bad movie ever made, The Disaster Artist is fantastic even if you aren't familiar with The Room. A working knowledge of Tommy Wiseau's baffling directorial debut does make The Disaster Artist more satisfying, as it references The Room with precise, scathing-but-loving detail. As Tommy Wiseau, an immigrant of indeterminate origin who moves to L.A. and tries to become the biggest star the world has ever seen, James Franco disappears in the role, emulating Wiseau's absurd idiosyncrasies and speech patterns perfectly. By focusing the central narrative around Wiseau and Greg Sestero (Dave Franco, who tries his best, but is one of the film's very few weak points) and their oddball friendship, The Disaster Artist humanizes Wiseau, but doesn't shy away from depicting how manic creative energy can drive people to ridiculous and hurtful behaviour. It's an empathetic, hilarious and surreal film about integrity, individuality and the nature of fame. With Heaven Knows What, brothers Josh and Benny Safdie proved they knew their way around New York's grittiest corners, but Good Time saw them outdo themselves in every way. The film, a dark, pulpy thriller that takes place over the course of one heart-pounding night, is highly stylized and endlessly tense, making the most of its stellar cast (including vets like Robert Pattinson and Holly Hunter, alongside star-making turns from Buddy Duress and Benny Safdie himself) and Oneohtrix Point Never's appropriately aggressive score. Good Time is an instant cult classic, and will likely be remembered as the pivotal point in the Safdie brothers' career. Primarily known for playing the role of a floundering young adult in films like Frances Ha, Mistress America and Maggie's Plan, Greta Gerwig stepped behind the camera this year for her solo directorial debut, Lady Bird. Saoirse Ronan brilliantly stars as the titular young character (whose name is self-imposed), bringing the uniquely teen combination of naivety and know-it-all-ness to the character, as she navigates the joys and heartbreaks of adolescence. The relationships created between Lady Bird and her friends (new and old), her young loves, and especially her parents are raw and relatable, perfectly capturing that sense of melodrama in the minutiae that every teen girl knows. As laugh-out-loud funny as it is heart-wrenching, Lady Bird is a beautiful coming of age tale that will continue to resonate with audiences for generations to come. Jordan Peele's Get Out is a startling directorial debut, and one of the best new horror films in a decade. More than anything, it is 2017. Get Out took the year's biggest social and political conversations around Black Lives Matter, white supremacy and covert racism, and transformed them into an allegorical nightmare that unfolds with slow and satisfying menace. Infinitely smart, with nuances that get better and better with each rewatch, Get Out never panders or settles for easy resolutions. Peele delights in introducing creepy hints and clues as to what's going on, erupting into a twist that perfectly embodies America's dark past, present and future. It's also just a flat-out great movie, full of unsettling tension, effective scares, discomforting scenes that make us cringe in recognition, and biting dark humour that pulls from Peele's extensive comedic background. The horror genre in recent years has excelled at turning the mirror inwards to peel apart the layers of darkness that permeate society, and with Get Out, the bleak reality that black people face every day was exposed via a tight, smart, fantastic thriller.